Misleadingly called the Yellow flat-footed fly it is in fact vivid orange and the only totally orange member of its family in Britain. 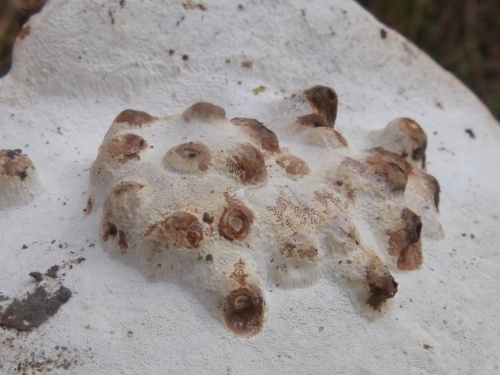 Agathomyia wankowiczii is also the only invertebrate in Britain known to cause a gall on a fungus, and a very specific fungus - Artist’s Bracket fungus (Ganoderma applanatum). Where Artist’s Bracket fungus (Ganoderma applanatum) is found. The galls can be seen throughout the year. The Artist’s fungus is a hard fungus which grows slowly enough for the fly to lay its eggs and harbour the growth of the offspring before the fungus decays. Because of this it is the only host that can support this insect. Astonishingly this is currently one of the only insect and fungi gall combinations known in Britain! The gall is found in large clusters on the whitish underside of the fungus. They start as small warts that can grow up to 1cm in height. Inside each wart is the grub of the fly. Once the grub is fully grown it bores a hole into the top of the gall and falls to the ground where it buries its self into the soil before it pupates to turn into the adult fly. Although it well known in Europe it was first found in the UK in Kent in 1990. The adult fly is rarely seen so it is easier to search for the galls (which are easily overlooked because they are on the underside of the fungus). The species appears to be spreading northwards in Britain, as at March 2018 it is known from (approx) 58 hectads. It has been recorded in VC55 (Leicestershire and Rutland) since2003. gall on underside of bracket fungus.